I’ve already posted here about Battlefront Miniatures and how I feel that their new releases are changing style, becoming bulkier and gaining oversized heads and oversized equipment. 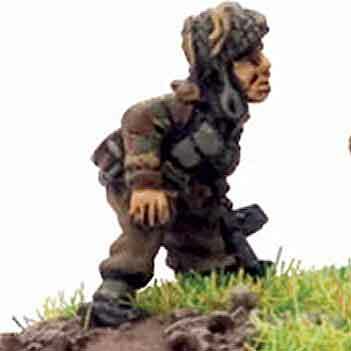 Well this trend has reached a new low with the company’s latest releases, British Paratroopers. Battlefront are producing the 15mm equivalent of heroic scale 28s – grotesque parodies of the human form, carrying huge weapons and massively oversized equipment. Tim tops off this rant with a lovely photoshopped picture which shows what a Sherman Firefly would look like if it was given this “heroic scale” treatment. Well I’m with Tim on this one and do not welcome the move by Battlefront to start producing their 15mm infantry in this style. It’s such a shame, they used to make really good figures that fitted in well with other ranges on the market. Just take a look at the size of the head on this guy below. It’s over a quarter of the total height of the figure . Normally proportioned human beings have heads that take up between one sixth and one eighth of their height so that para’s head is somewhere between one and a half and two times the size it should be. LtCol Pine-Coffin. Here again the figure is four heads tall. For comparison this reenactor is about six and a half heads tall. On the right I’ve made him heroic scale – 150% sized head, hands and feet. He’s still not as out of proportion as many of the Battlefront figures. He looks a bit like this guy who is carrying a rifle that looks to be double scale width and has helmet straps oversized about the same amount. And take a look at this guy below. It looks like the paras have been recruiting from the cast of the opening scene of 2001 a Space Odyssey. That’s not a para, it’s an ape in a denison smock. Hands like shovels and a jaw to match. Some posters on the FoW forums have tried to defend the realism of these models on the grounds that in real life people come in different shapes and sizes. Well they don’t come in those shapes. Still the fanboys love these models and, thanks to Battlefronts marketing muscle, I’m sure they’ll outsell the more realistic offerings available elsewhere. I just hope other 15mm manufacturers don’t follow Ballefront’s lead in this. Previous story Warhammer 40K – cheap and cheerful.